Discover Budapest through the eyes of a local on a private 5-hour tour. It's a great option for travelers who only have one day in town or those wanting to orient themselves to the capital city for future exploring. The exclusive excursion begins at your accommodation and continues to Andrassy Avenue, the Castle District, and more. Listen as your engaging guide shares entertaining anecdotes and lesser known history. In the Pest side of the city you might explore the central Saint Stephen’s Basilica and its lookout tower, the Gresham Palace which today awaits its guests as the beautifully restored Four Seasons Hotel just a few metres away from the Chain Bridge and the stunning view of the Danube Embankment with all its sights listed on the UNESCO World Heritage List from the Shoes Monument to the House of Parliament or the wonderful bridges crossing over the River Danube. The cafés, bars, shops, and numerous museums and sights all along Andrássy Avenue such as the Hungarian State Opera House or the wonderful Art Nouveau building of the Parisian Department Store and the beautiful Lotz-frescoes of the Book Café inside the building also await you among others. You can even browse through Hungarian pieces of literature or travel books about Hungary in your mother tongue in the bookstore of the same building or with the help of your guide, the adventurous can find the entrance to the the cool rooftop place called 360 Bar still in Anrássy Avenue. Why wouldn’t you check out some of the famous ruin bars, just like Szimpla or Mazel Tov of the area where the Music Academy and the most important Hungarian Jewish heritage sights can also be found, namely in the historical Jewish Quarter? Still in the Pest side, the City Park is inevitable: you can visit Heroes Square, have a look at the building complex of the Széchenyi Thermal Bath and Vajdahunyad Castle, or the Ice Rink building. Using some quick way of public transportation (subway, tram) or even the Funicular it is easy to get to the Buda side and top on the Castle Hill District. Visiting the Buda Royal Palace (which hosts the National Gallery and the Budapest History Museum today) the Matthias Church, the Fisherman’s Bastion, together with the atmosphere of the cobbled streets and the medieval residential buildings, galleries, bistros and bars, the views back on the Pest side and on the rest of the green Buda Hills with the Citadel, the Statue of Liberty, the emblematic building of the Gellért Thermal Bath or the Ottoman Turkish dome of the Rudas Baths will make your day! It's a never-ending story. Come and read a chapter for yourself! Recommend this tour/guide VERY HIGHLY! 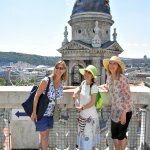 Get quick answers from Budapest Highlights Private Walking Tour staff and past visitors.